Before we moved in, we heard lots of stories about the men with whom we would be working and living. And since Lowell and I can both see, the holes in the walls and the MDF everywhere else did not go unnoticed for either of us. 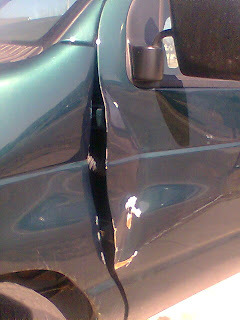 Once we moved in, we began to hear stories about the damage to the van and exactly how it happened. However, we heard from the horse's mouth (meaning the guy responsible for the damage), that it was a very windy day, he opened the door, and the wind blew so hard that the van doors got all bent up. In his defense (because he definitely needs one here), it is really, really windy here. Now I know Dorothy and Toto blew away from Kansas, but come on, really, how often do you see "wind damage" like this, unless they are tornadic winds? Even if it were the wind, we are having a hard time figuring out how he was able to accidentally damage both the passenger's side and the driver's side. Insurance isn't too keen on covering damage such as this. (Crazy huh? You would think there would be some rider on the policy for those times when you get so mad you kick the car doors in, but, no.) 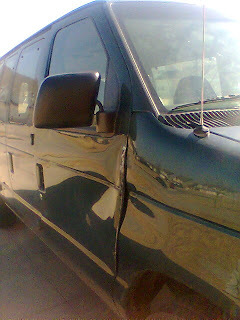 So it looks like we may be driving a beat up ole van for a while. The good news is that we don't ever feel like we have to park far out in the parking lots to avoid a cart hitting us or a car door dinging the sides.